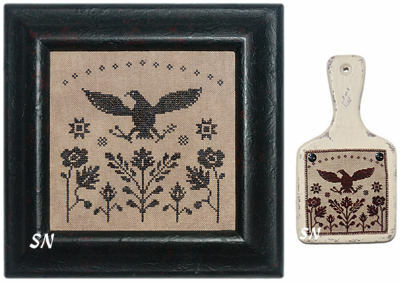 Lovely, hand-made primitive hornbook frames and thread organizers... the wooden feel of these pieces is wonderful. Just a bitty wisp of a design, offered in a tiny kit. 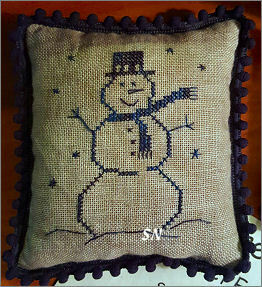 Stitched on Weeks 35ct Straw hand-dyed linen with Gloriana's In the Navy silk thread, this measures only 62 x 42 in size -- just 2-1/2 x 3-1/2 in finished dimensions. Priscilla's Pocket did another little blue design -- A Snowman -- for this year. The other three -- bunny, kitten and cat are just as bitty and just as cute. 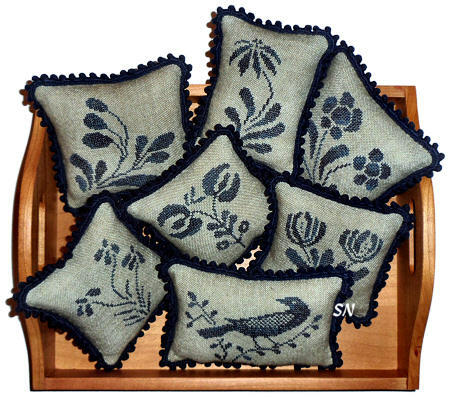 Little bonuses to complement her lovely stoneware patterns, this comes as a small kit of 32ct Tin Roof Weeks Linen with Gentle Art's Black Raspberry Jam hand-dyed floss and enough of Dames of the Needle's blue ball trim to edge your little cushion. Just cute... last year, they showed the little bunny stitched in several different pastel shades of floss... pink, yellow, mint green, lavender. Just find the ball trim first, then floss to match! So cute! 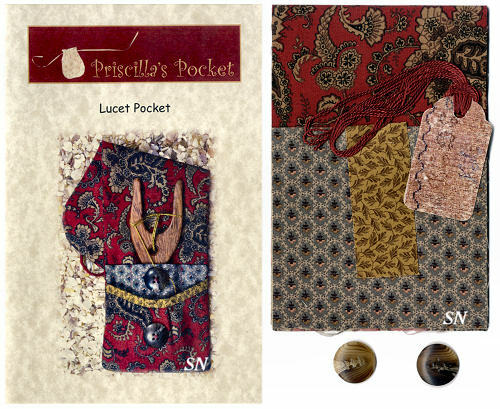 Priscilla's Pocket has a new mini-cushion kit to accompany her cat and kitten. She has some cushion designs that are inspired by old stoneware patterns -- the dark blue on tan pottery. Cat and Kitten have been past Market exclusives that she is still making for us, and now Bunny is this years'! Stitched on Weeks Dye Works Tin Roof Linen, you get the chart, linen AND the 'Wonka's Blueberry' colored mini ball trim by Dames of the Needle for your finishing. You will need Gentle Art's Black Raspberry Jam floss to stitch this. 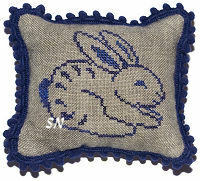 When we were at the show, They had this little bunny stitched in EASTER colors!!! It was darling! Just choose your trim first, as there are the fewest color choices of that, then match a pastel fabric and hand-dyed floss! 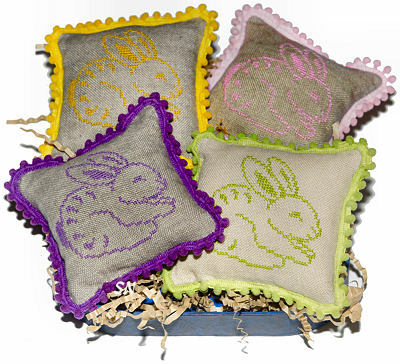 Stoneware Bunny finishes less than 3 x 3... the entire collection of these stoneware cushions is SO COOL together! Let us know if you want us to choose an additional color combo for you... we can do that too! Priscilla's Pocket continues her charming set of Salt-glazed Stoneware pin cushions... this set of 7 brings the total in the collection to 21!!!! Beautiful and tiny, each cushion is stitched on Weeks Dye Works 35ct Tin Roof Linen in ONE shade of thread -- Gentle Art's Black Raspberry Jam. Our charts all come with the matching 3 yards of mini-ball fringe trim by Dames of the Needle. PERFECT to finish all seven cushions in the chart pack, these are so petite (2 x 2-ish!) and cute!!!! We have a small basket display that gets played with everyday in the shop!! 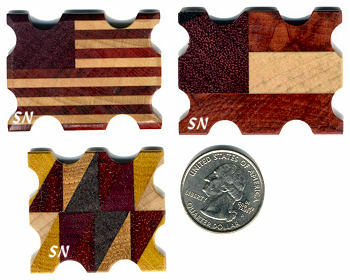 Purchase a fat quarter 18 x 27 cut for these... if you're careful, you can get a million on there (or at least maybe 24??) Presented as the chart with 3 yards of matching trim. Tiny Market Exclusives by Priscilla's Pocket -- These are a *TRY ME* thing! Bitty kitties -- with that Salt Glaze Stoneware flavor -- each comes as a small kit of chart, 35ct Week's Tin Roof Linen and just enough of that matching mini-ball fringe by Dames of the Needle to make your 2-inch-ish pin cushion!!! 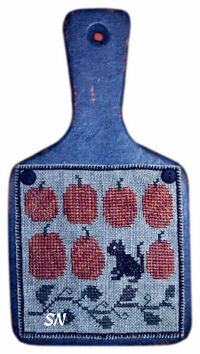 So... in the middle of that glorious dish of pottery motifs, you can hide your matching mini-kitty or mini-cat cushion! 2015's Special kit was the CAT - still available to shops that purchased at the show (that would include The Silver Needle!) and 2-16's Special Kit is the KITTY! So sweet! Presenting a trio of exquisite miniature thread winders -- all made from different woods. 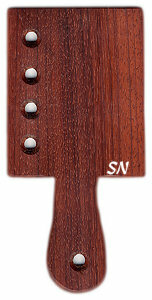 Measuring less than 1-3/4 x 1-1/2 inches in size, they are cross cut from blocks of different woods. 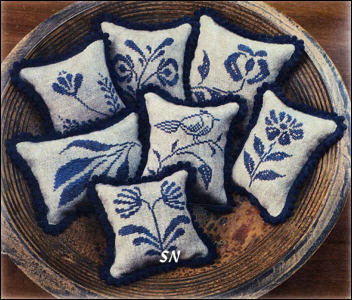 Gosh, this is a beautiful little collection of pin cushion designs all inspired by Salt Glazed Stoneware motifs. Offered in a chart format, they are all smaller than 64 x 51, are worked on Weeks 35ct Tin Roof with Gentle Art's Black Raspberry Jam hand-dyed floss. The finishing trim is Wonka's Blueberry hand-dyed mini-ball fringe by Dames of the Needle -- and we have included the 3-yards you will need to finish all of these! The first set is charming -- we have them all stitched and perched in a basket -- so now, we'll have 6 more to add to them! *Here's a nice display idea: Find a TALL GLASS VASE or JAR. 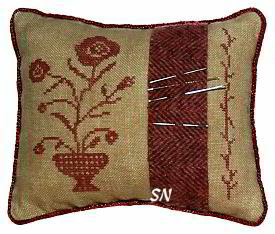 Toss your cushions into it -- arranging them so that your stitching shows. Let them nestle and 'overlap' each other a bit... get them mooshed in there... they look lovely from every direction and take up less display space! From Every Mountainside (also shown at right, and available below) was their first design... and now, here is the companion. You'll need to choose some hand-dyed cottons, and a pale blue linen color. This is offered as a chart, with that small wooden hornbook separately. Here's another endearing Patriotic design we just had to have! By Priscilla's Pocket, stitch the little girl waving her flag over one on 40ct. (sorry about that...!) She is worked in Crescent Colour's Belle Soie Silks -- 8 different colors in this! She measures a mite 1-1/2 x 2-3/4. 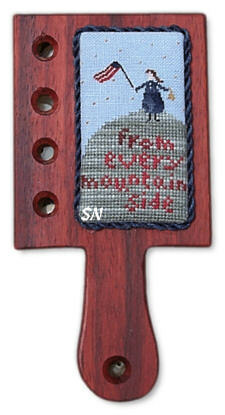 Then, mount her onto this cool, handmade wooden hornbook thread palette. It measures only 4 x 4 with a two-nch handle. Really pretty... who wouldn't love to have this??? Offered as the chart, with horn book separately... in case you want to stitch it on something larger and finish it a different way. 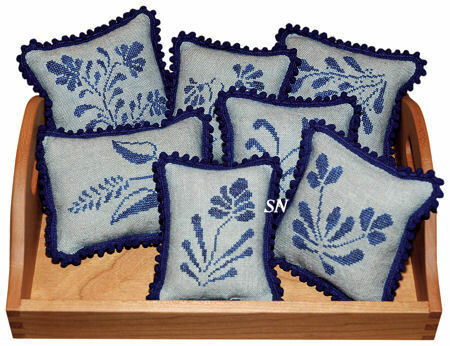 This is a set of charts to make 6 small pin cushions reminiscent of stoneware patterns! Stitched on 35ct Weeks hand-dyed Tin Roof linen with Gentle Art's Black Raspberry Jam floss, each finishes about the same size, but not quite. We have packaged the 3 yards of Dames of the Needle MATCHING mini-pom-pom ball trim you see around all of these! All of your cushions will match and make a charming set! 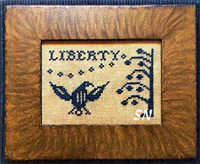 Spacious Skies -- A sophisticated, monochromatic piece, the stitch count is 85 x 84, and it is worked in only one color. Choose a pretty hand-dyed for interest -- black, dark navy, rich deep red... whatever you like. If you want to mount it on Priscilla's little hornbook... get it first to match your thread and fabric colors -- you'll just need any 36ct. 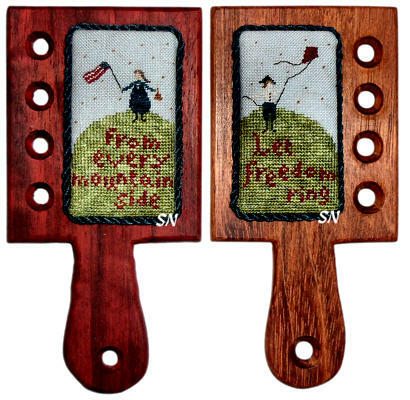 Patriot's Trio -- Here's another set of designs that can be framed or stitched to fit on those fun little Miniature Hornbook Paddles. Worked on 35ct Weeks Tin Roof linen with hand-dyeds of Dried Thyme, Garden Gate, Grecian Gold, Old Red Paint, Parchment, Shaker White, Uniform Blue and Lancaster Red... these are absolutely enchanting pieces! All three are offered in the same chart. We have JUST A FEW Pockets for your Lucet! 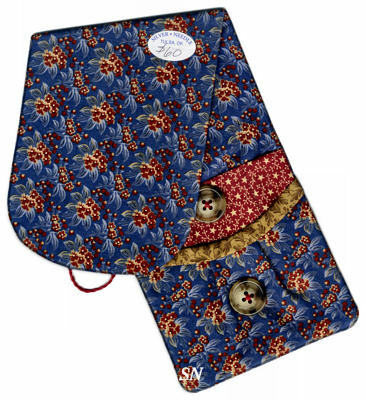 All made of lovely, antique-y cotton fabrics, you have three options. 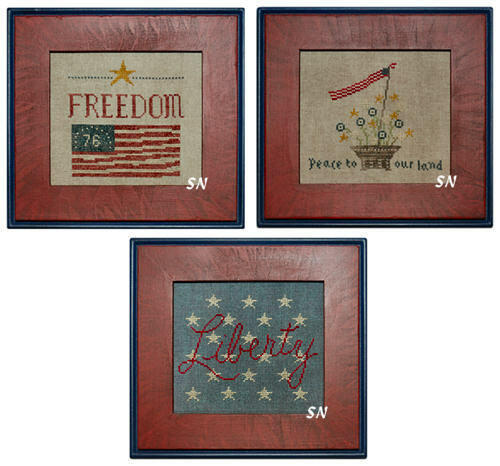 Well these are a really cool way to finish and display your needlework! Completely handmade, painted and finished with distressing, these measure approx 3 inches in size in the display area, and are approx 5-1/2 inches in overall height. Just petite things... you can drill holes to actually sew your needlework on by the buttons... or get bold and CAREFULLY use a bit of sneaky glue!!!!! Very primitive, and as I said... a really nice way to highlight your tiny works of art. VERY fun sitting on a table or perched on a shelf beside a special sampler. We have several colors available -- have a preference? Who's in the Pumpkin Patch? 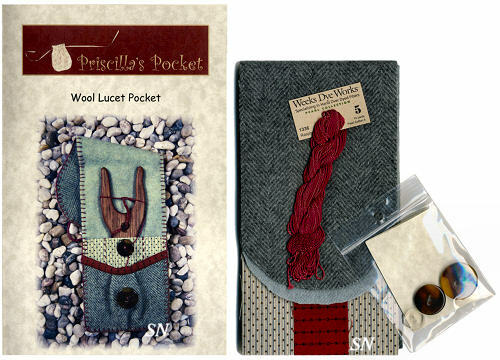 Priscilla's Pocket has a sweet design that is worked over one thread on 40ct linen, and then attached to one of her hand-made wooden paddles. 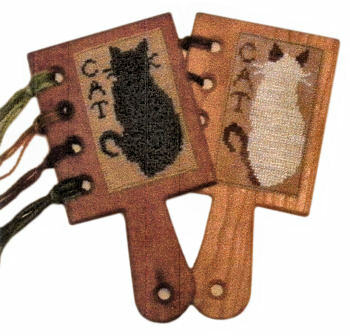 Available as the pattern and paddles separately, you can stitch the kitty and pumpkin design and mount it on a darker wooden piece, or change up the border color if your paddle is a different color. They recommend drilling your wood to actually *sew* on the piece with buttons at the four corners... but our shortcut is a bit of glue -- I'm much less dangerous with a drop of glue than a drill!!!!! Who's in the Pumpkin Patch is offered as a chart and finishes approx 3 x 3. I purchased 3 x 5-1/2 paddles in a distressed mangy black/old brick color, creme with natural distessing, and brick red with touches of grey distress -- because kitty looked good on any of the three of them! This is a sweet design... stitched with your favorite color of Week's hand-dyed floss, on your favorite color and count of Week's hand-dyed linen. Next, choose the matching wool to your thread (you could use Herringbone on the front like this one and mix Houndstooth on the back for instance), and the matching #5 Perle Cotton to make your Lucet Cord. Grab your little wooden tool, and gather some ground walnut shells for stuffing... and you'll have a charming pin cushion that features a wool band on the front to actually HOLD your needles, instead of letting them slip into oblivion inside the cushion! These are the CUTEST! Featured on Needlemade's Black Cat and Priscilla's Pocket's From Every Mountainside designs... this small paddle doubles as your frame and thread organizer. Measuring only 3 x 6 overall... it features 4 holes for threads... and a charming *chunky* design statement. 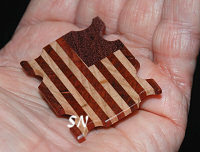 Each is hand-made, and available in various woods... our selection varies in color. LOTS of personality with these, find anything small to mount. Simply cut a board, wrap needlework around it, trim with a bit of cord if you wish, and you're finished. 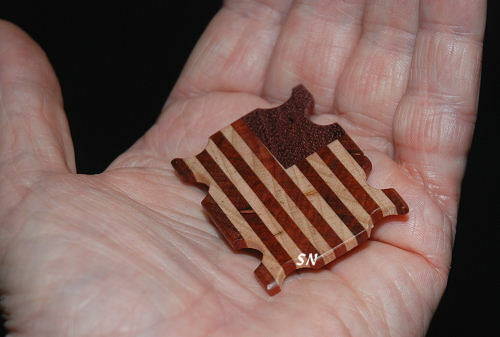 Just an ENDEARING little wood piece! Oh... these are CUTE!!!! Be Needlemade Designs, choose your favorite kitty-color and stitch him on almost any count of linen, to finish onto one of Priscilla's Pockets hand-made chunky hornbooks! Stitch a black cat or a Siamese, and trim with a border of Nun's Stitch. Offered as a leaflet, there is history of the Nun Stitch included, as well as advice about loving your kitty. Designer, Linda, warns that these are easy enough to stitch and give away as gifts... and the easiest way of finding new homes for your cats!! !